Posted July 29, 2015, 9:02 p.m.
Posted July 15, 2015, 12:34 p.m. When Kevin Norwood was shot to death at the Compton Flea Market in 1989, he was just 18. “I lost my mind,” says his mother, Rita Norwood Belfry, pounding on doors around her Compton neighborhood, trying to flush out her son’s killer. Belfry, a community activist best known as Ms. Ritta, has known many other shooting victims in the 40 years she’s lived in Compton, but the final straw came July 12, when Darrell “Shadow” Hines, another nephew she raised from age 8, was shot and killed at Caress Avenue and Marcelle Street, just a few blocks from her home. Hines, 38, had just left a vigil for Travione Mason, a 27-year-old man who grew up in the same neighborhood and was killed July 11 while he was catering a party in Westmont. Her nephew went to the vigil out of respect, Belfry said, to light a candle for his former neighbor, who had one child and another on the way. And as Hines sat in his car preparing to drive away, someone walked up to the front passenger door and shot him dead. “This is where it stops,” Belfry said. Belfry is willing to put her own money behind making it happen. She’s holding a news conference at 11 a.m. Thursday at the site where Hines was killed because she wants to speak directly to the neighborhood. There were many people at the vigil that night, she said, and neighbors who probably knew Hines as a boy. Belfry borrowed money to remodel her home earlier this year, and Hines, well known for his skills in mechanics and carpentry, had started some work before he died. Now, Belfry says, she intends to take the money she was going to use on her home and offer it as a reward. No one was ever arrested in the killing of her other nephew Deon. And although investigators believe more than one person was involved in the gunfire that killed her son, only one young man was charged, but that man spent just a year in jail, in part because no witnesses came forward, she said. 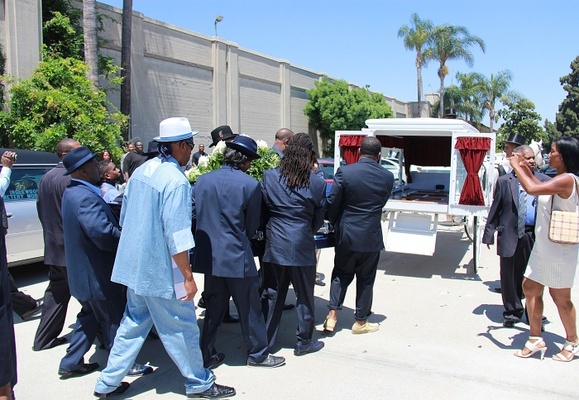 Nearly 400 people turned out for Hines’ funeral at Inglewood Memorial Park on July 25. The service lasted nearly three hours. Mourners remembered Hines as a warm-hearted and peaceful man who loved fishing, barbecuing and helping people as he could. Hines had his time in a gang when he was young, Belfry said. He went to jail “for being stupid,” she said, and when he got out, he turned his life around, doing carpentry work with his motto, “Darrell Does It,” and opening a body shop called Luxury Custom with a longtime friend. People spilled out of Belfry's home after the funeral, remembering how Hines tried to make people happy, and how he had started working with kids in the neighborhood, taking them fishing and trying to show them alternatives to gang life. "What we have to do is reprogram our children's minds," Belfry said. "I don't own a gun or even touch a gun, but these people are shooting guns like it's a shooting range, and they don't care who they hit." — Lorna Mae Hawkins May 16, 2017 at 7:19 a.m.
Hi people, Your Astella 8 *. — Danieltype Nov. 9, 2015 at 4:36 p.m.
— Twin Oct. 17, 2015 at 7 p.m. This was a good man,cousin I'm sorry you had to be called home before your time. On long beach blvd and marcell. My brother Marcellino Partway was killed by some hood called" snot said " . Our whole family wants justice for our lost love ones. Even the police killing people. — Nikki Scott Aug. 14, 2015 at 7:57 p.m.
My friend and brother life was took selfishly from us who truly loved him and respected him.he will never be for gotten.those responsible for this will be brought to justice.The streets is a lie but don't lie at the sometime.rest my brother well.I love u LOC..popcorn. — popc Aug. 10, 2015 at 4:27 p.m.
R.I.P Kevin Norwood I miss u fam!! — Bigunk Aug. 7, 2015 at 12:05 a.m.
— Domonique Jakes Aug. 4, 2015 at 7:34 a.m.
but then it's always someone else's fault right ??? — nobody Aug. 4, 2015 at 12:46 a.m.
— steff Aug. 2, 2015 at 12:26 p.m.
— Cami Aug. 1, 2015 at 8:05 p.m.
— Eva Patton Aug. 1, 2015 at 9:55 a.m.
God can change anything and will reveal the person who killed my little cousin. He is an Angel watching over us now. No matter where you live, tragedy can come to your neighborhood. — April Irving July 31, 2015 at 5:21 p.m.
Much love and respect to you young brother. — Darren hardwell July 31, 2015 at 4:48 p.m.
— Sherry July 31, 2015 at 1:03 p.m.
— venus July 31, 2015 at 12:43 p.m. SHADOW!! You are loved and missed...still in disbelief. — Portia July 31, 2015 at 10:57 a.m.
— POPEYE July 30, 2015 at 1:16 p.m. When will people understand that these neighborhoods will never change. I work throughout all of South LA, Compton included, and cannot describe to you the things I see each and every day. Its an absolute dump. Save up money and get out. — Sean July 30, 2015 at 7:44 a.m.